The 46 Defense was designed in the early 1980s by Buddy Ryan with the Chicago Bears. 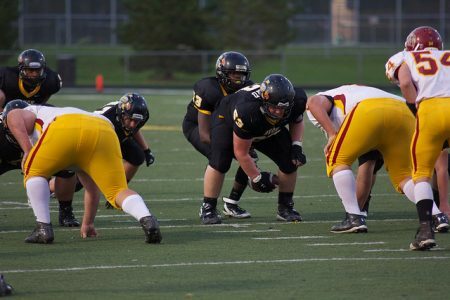 Most folks know that – and hence, the nickname, “Bear” Defense. It was the defense of the dominant 1985 Bears team. The defense has its basis in the old 5-2 Double Eagle front and is easy to adapt from the 4-3 Defense. It is an 8-man, run-stopping from that works well with man coverages and with Cover 3. Every defensive package should have some sort of 46 Defense (Bear Front) in its package. And it isn’t hard to install. It works with Odd Front or Even Front defenses. 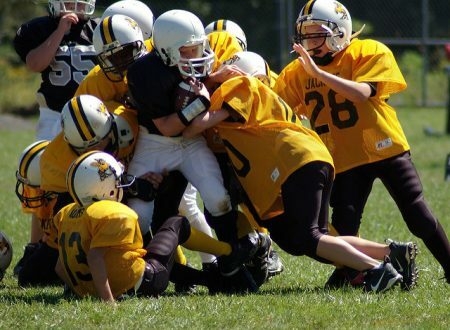 Whether you want to make the 46 Defense your Base Defense, or expand your package with aggressive change-up for stopping the run or pressuring the Quarterback, you’re in the right place. It’s time to learn the basics of The 46 Defense. All of my information on the 46 Defense comes from Rex Ryan and Jeff Walker’s Coaching Football’s 46 Defense book. I’ve used variations of the front with different packages, but never as the base defense. 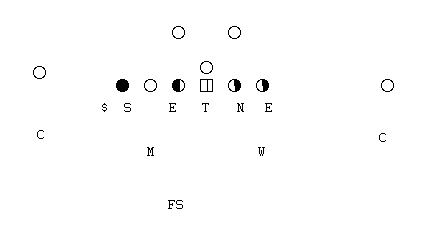 The alignment of the 46 Defense centers around the 3-0-3 alignment in the middle. This means we have a Defensive Lineman aligned on the outside shoulder of each of the Guards, and a head up Nose Guard. In the diagram above I’m showing the 43 Defense adapted to the Bear Front, where the Strong End slides down to a 3-tech. I refer to any front with this 3-0-3 alignment as a Bear Front, mainly because of the effect it has on the offensive blocking schemes. The biggest advantage of this front is its almost impossible to create double teams, especially on your Nose Guard. If you have a dominant defensive lineman that can play that 0-technique Nose position, this is a big advantage. The weak side Defensive End stays in a 5-Technique. 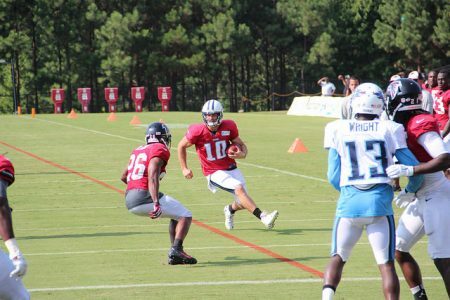 On the strong side, one Linebacker is going to walk up on the inside foot of the Tight End while another Linebacker or Safety is going to walk up on the outside foot of the Tight End. Who you want to do this is going to be based on your own personnel, so don’t get caught up in the letters! The two Linebackers remaining are going to line up in 40-techniques, 5 yards off the ball and head up over the Offensive Tackles. The 0-tech nose is going to handle the play side A-Gap. He’s a 2-gap player. The two 3-tech Tackles handle the B-Gaps. They’re attacking the outside shoulder of the Guard. The weak side end plays a 5-technique and handles the outside and contains the play. He needs to hold the point on that tackle and not let the B-gap widen. Its more likely that he’ll just be forcing plays to the sideline than necessarily turning them back inside. The Sam Linebacker walks up on the inside foot of the Tight End and hammers him, reading the footwork of the Tackle with his eyes. If the Tackle goes down, he’s going to squeeze down expecting a pulling Guard or Fullback. The Safety (or whoever you choose) is walked up on the outside foot of the Tight End. He’s hammering him and controlling the outside. He is the box/contain player on the strong side. The 40-tech Linebackers are reading backfield action. All of the gaps are controlled except the A-Gap the Nose does not control. On outside flow, the backside linebacker works over to play cut-back to that open A-Gap. The Play side linebacker plays off of the Defensive End or Safety, expecting him to either force the play back inside or force it to bounce. He needs to make this guy right. On hard flow, inside flow runs the backers are filling up any open space. There’s just no real bubble to run an Iso to, and defending Power and Counter is going to be based off of how the player being kicked out plays it. The DL will be looking to wrong arm, so plays should bounce. We need a stud at Free Safety. Someone who can play center field on Cover 1 or Cover 3, but also run the alleys and clean up outside runs. As I mentioned, the coverage for the 46 Defense is mostly going to be Cover 0, Cover 1 or Cover 3 – which should be the case with any 8-man front defense. You can come up with all of the exotic looks you want, but that’s going to be the basic look. Trying to find the perfect defense for your football team? I’ve put together a manual that will take you through a 7-step process to figure it out: click here to download it now.